It is our goal to offer an environment where everyone can know, love, and serve the Lord. The reception of the Sacraments, and participation in the community of believers helps make this possible. As catholics, we encourage all Christians to enhance their own lives by reclaiming our shared heritage. We encourage them to become active participants in building a future of ecumenism and spiritual growth. We strive to look beyond the sectarian details and seek in a deliberative fashion to understand what it means to be a committed Christian today. We perceive the Scriptures, with the guidance of the Holy Spirit, in the light of the experience of Reason and Apostolic Tradition. We hold a vision for a more mature and relational Christianity. A Christianity which reconciles genuine faith and commitment with intelligence and experience. Our church respects a couple’s right to plan their families in a responsible way. Through the Church we offer the opportunity for lay or ordained ministry. We admit men and women to religious life and to all levels of Holy Orders. We do this without regard to marital status, sexual orientation, race, ethnicity, or physical disability. We offer the Sacrament of Marriage for prepared couples regardless of gender. Divorced couples are welcome to seek a second marriage. We strive to help those less fortunate by offering services and help to those who are homeless, mentally, or physically ill. We also help those who are struggling with a wide variety of addictions. As independent clergy, our ministers experience a diverse range of situations. Some lead communities, parishes, religious orders or sodalities. Others are active in such areas as wedding and funeral ministry. Some provide outreach ministries, counseling, scholarship, and workshops on aspects of spirituality. Our ministers have to complete theological and ministerial training before ordination. You can find more information on our Vocations page. During the past few years, our church has experienced dynamic growth. We have seen many inquiries about our work from people all over the world. Those who seek to join us in ministry find our church’s spiritual and jurisdictional approach attractive. They appreciate that the church maintains a spirit of a fellowship of Christian love. We are less concerned with money, buildings, and temporal power. 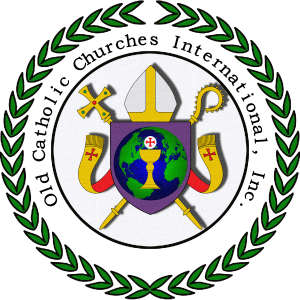 As of June 19, 2013, the Old Catholic Church International, Inc. is an incorporated entity within the State of South Carolina. We thank you for your interest in our work and pray for your onward journey in faith. A lamp cannot be kept burning without oil; nor can the light of spiritual gifts continue to shine unless one inwardly sustains it with actions and thoughts consonant with it. For every spiritual gift requires a corresponding inner quality in the recipient to feed it spiritually as though with oil, thus preserving its presence.